Jennifer opened her talk by posing the question: what is experimental archaeology? It is a way of answering research questions and testing hypotheses by experiment. She described several such experiments, some of which were carried out by undergraduates in the Harris Gardens at the University of Reading. Can we chop down a tree with a stone axe? It has been shown that a small tree can be felled in 15 minutes and that three men can clear 500m in four hours, giving a clearance rate of 0.2ha/man/week. This is the sort of information that cannot be obtained from a study of artefacts alone. The discovery of Mesolithic footprints in the mud of the Severn estuary at Goldcliff presented another opportunity to experiment. Severn mud was brought to Reading, where it was found possible to distinguish male and female footprints from the age of eight from their stride and footprint size. As another example, aNeolithic building excavated at Marden Henge in Wiltshirewas associated with piles of fire-cracked sarsen stones. The excavator, Jim Leary, thought the building may have been used as a sweat lodge and a half-size replica was built in an attempt to see if this was feasible. The wattle-walled structure was roofed and heated stones doused with cold water. Repeated dousings produced steam for up to 20 minutes and created a stifling atmosphere that may have provided a ritual element to the activity. The use of heated stones as pot-boilers to cook food is commonly assumed but could have left an unpleasant mineral sludge in the bottom of the stew pot. Jennifer and her students set about to determine whether Neolithic pots could have been heated directly over a bonfire. Clay pots made by the coiling method were first fired in a bonfire with a 98% success rate. The inside of a pot was then rubbed with pig fat or butter (traces of both have been identified in Neolithic pots by lipid analysis) to make it waterproof. 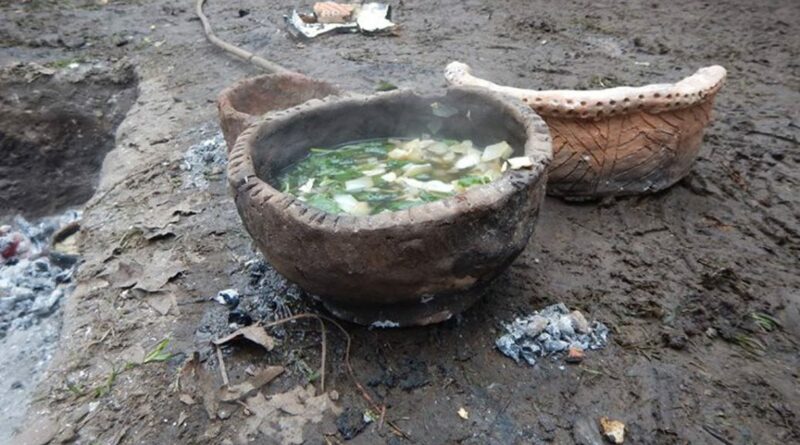 The experimental pot was found to cook vegetables (and nettle soup) very well indeedand could be reused several times. In another cooking experiment a whole salmon, wrapped in damp cabbage leaves tied with string, was successfully cooked in the ashes of a fire pit. On a different scale entirely, several experimental earthworks have been constructed to study the effects of natural erosion over time. The Overton Down earthwork in Wiltshire was built in 1960 and excavated 32 years later; another was built at Wareham in Dorset in 1980 and excavated after 17 and 33 years; and in 1984 Peter Reynolds designed an octagonal earthwork at Wroughton near Swindon, which exposed the banks to the elements from different compass directions. The outcome has been to show that banks and ditches stabilise quite quickly within about 25 years: and that earthworms from the original ground surface migrate up into the bank and play havoc with the stratigraphy. On a final note, the excavation of an experimental Iron Age roundhouse built at St Fagans in South Wales produced a remarkable series of artefacts: a tongue stud, biros, spectacles and balls of wool. But interestingly these were all found around the periphery of the house, just as Iron Age artefacts are in real excavated roundhouses.